UPDATE - Matching Funds Now Available! A first-time donor has made a generous pledge to match all new gifts to the 150K Campaign at Bethany. This special donor believes in the Christian higher education delivered at Bethany, and is offering to MATCH UP TO $50,000 for the campaign. Breaking it down – Beginning March 20, 2019, every gift given towards the 150K Campaign will be matched dollar-for-dollar until the donations total $50,0000 ($100,000 with the match). It’s been an exciting school year at Bethany Lutheran College. We’ve seen record enrollment, our new programs are growing, and our co-curricular programs have seen wonderful success. And while we’re pleased with the present, Bethany is always looking to the future. Last year to support our growth, new programs, and future success, we were challenged to raise $75,000 in 75 days. The response was overwhelming, and it was very exciting to surpass our goal and see nearly $125,000 in gifts. In 2019, we have been challenged again! 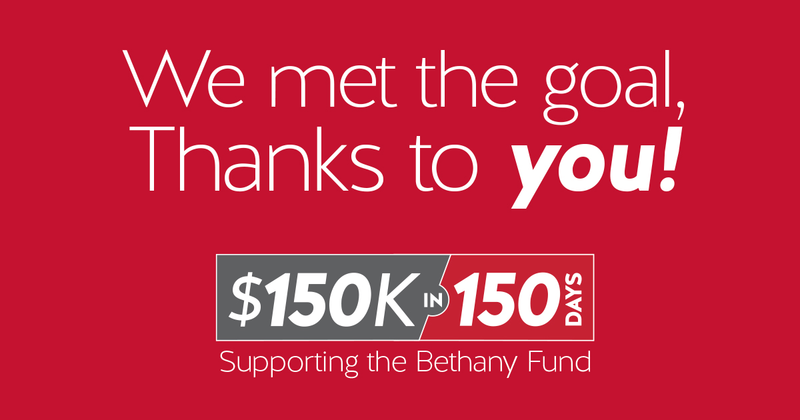 All gifts for the 150K in 150 Days Challenge will be directed to the Bethany Fund, which supports our growing student body and programs on campus, and will support Bethany Lutheran College for the future as we work to offer the best Christ-centered, college education possible. BLC Phone-a-thon – If you receive a call from a Bethany student during our annual Phone-a-thon that runs until Sunday, May 5, 2019, you can pledge, or pay over the phone via credit card. By phone - Call Christopher Kind (507-344-7862) or Jake Krier (507-344-7519) in the Bethany Advancement Office between 8 a.m.-5 p.m. (CST) or leave a message. Note: Progress updates are posted every Monday, Wednesday, and Friday.